Dogs have it pretty good: free shelter, free food, free belly rubs, etc. But they've been mostly excluded from one of the great pleasures of being sentient in America, and that's gorging oneself on cheap fast-food. Thankfully, Burger King is going to right this wrong. Behold: The Dogpper. It's a "flame grilled bone" and a "dog-friendly alternative to the Whopper sandwich." Supposedly it tastes like flame-grilled beef, but you're probably not going to verify that. Or maybe you are? We respect your choice either way. Know, however, that Burger King assured Thrillist that these are dog biscuits made by a company that specializes in dog treats (and the fine print says, "Not for human consumption"). 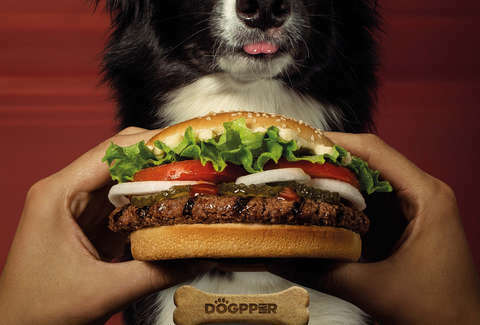 The Dogpper is only available through DoorDash and free when you, a human, order a Whopper. Plus, you can get that sandwich and dog treat delivered free with a $10+ order via DoorDash. You just have to use the promo code DOGPPER from November 28 through December 4. Also, there's a limit of one per person. Here's your chance to part of canine history.